I’m home from the show and just wanted to say that that I had a great time and enjoyed talking with everyone I met. I also want to congratulate Doug Robson on winning the drawing for the box of flies. Author Jason Randall will be speaking at two local Trout Unlimited chapters this week. At the Oak Brook Chapter (2/17/16, 7 PM) the topic will be ‘Where Trout Are’ and at the Lee Wolff Chapter in Carpentersville (2/18/16, 7:30 PM) the topic will be ‘What Trout See’. Jason has been an outdoor writer for the last twelve years with feature articles appearing regularly in American Angler,as well as Fly Fisherman, Eastern Fly Fishing, Western Fly Fishing and many other outdoor magazines. He is a veterinarian certified in fish health and medicine. He is also member of the World Aquatic Veterinary Medical Association and the Society for Freshwater Science. His trout trilogy has been extremely well received by the fly fishing industry including some highly recognizable names, and has been called a must read by many. A fourth book on nymphing techniques is due out in early 2017. 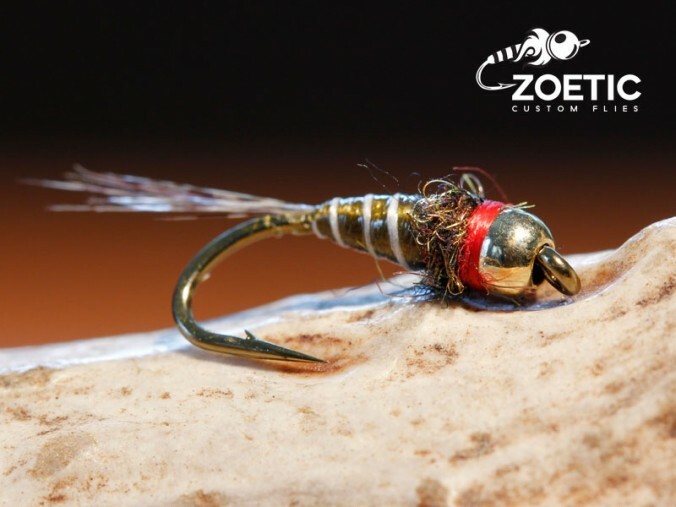 Another of Lance Egan’s creations, the Iron Lotus is a mayfly nymph imitation designed to be tough and drop quickly through the water column. With a tungsten bead and lead wire it is heavily weighted for it’s size. The streamlined thread body (usually olive or brown) is dense and offers little resistance as it falls. The Coq de Leon tail is more durable than one of pheasant tail fibers. Add in the glued body and you can bounce it off of rocks all day long. The Iron Lotus can be fished in multiple ways. Use it as an anchor fly in the small spring creeks of the Driftless Area combined with a scud dropper. Or tie it in as a dropper with a larger Czech nymph as the anchor for the deeper faster waters of the west. And don’t forget to drift it under an indicator. Below is a short article by Lance Egan about the Iron Lotus. Why is the Zebra Midge so popular? Let’s take a look. Midges can be as high as 80 percent of a trout’s diet and are found in ponds, lake, streams and rivers. With winter being here, there just aren’t too many other insects that are active and their importance in the food chain increases, especially in tailwaters. Colors for bloodworms can vary from bright red (low oxygen tailwaters) to more blueish green (highly oxygenated spring creeks). It is a simple pattern to tie, just a bead (glass, brass, tungsten) some thread and a wire. Anyone can tie it and the techniques used help to build the foundation for other patterns. It is most commonly tied in black or red followed by various shades of olive and brown. The body shape can be tapered or a uniform slim profile. The Zebra Midge can imitate a larva crawling down on the bottom or an emerger as it rises. The bead can give it the weight to get down or appear to be the gas bubble. This means you can fish it anywhere in the water column. Down on the bottom in an Euro nymphing rig or under an indicator or with a foot or so of the surface in a hopper / dropper set up. 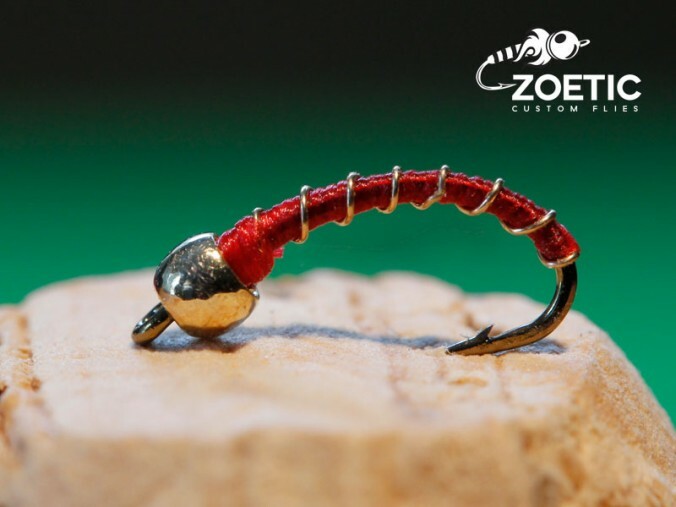 Want to use a straight hook instead of curved, tie in some herl, yarn or flash and call it something else, go ahead, underneath beats the heart of a Zebra Midge. 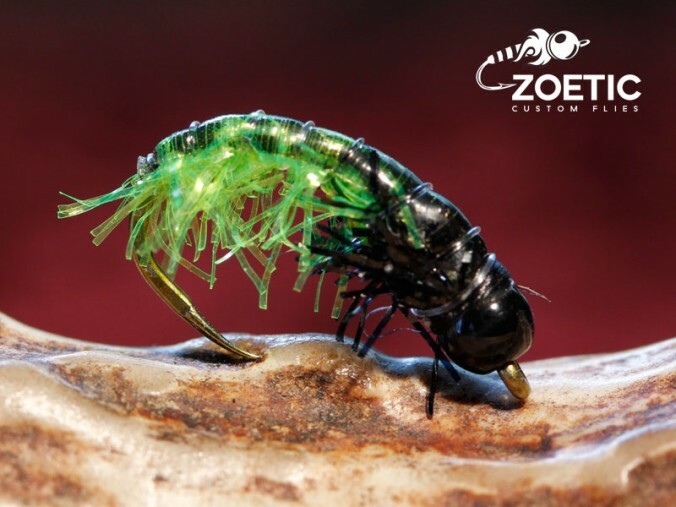 This fly and various color variations can be purchased in our online store. Why mix your own dubbing when there are so many colors and types of material already out there? I think there are really only two answers, the first is that no one has exactly what you want, the second is that you have a great source of material (a skin, pelt or ‘Honest honey, I have no idea where that bald spot on the dog came from’) that you want to use. The simplest method, especially if you’re making just a small amount, is by hand. Place the materials in a pile, pinch one end and pull. Keep repeating until the materials are mixed. The next is to use a fine tooth comb, such as a flea comb, do the pulling. Then it’s the same as the pinch and pull method. Both of these methods will align longer materials in the same direction. For larger amounts of material, put them into a container, add some water, cover and shake. Leave enough of an air pocket so you can get some good agitation action going. Pour off the water through a strainer and put the material on or in between paper towels and allow to dry. Fluff up before using. Now we get into the kitchen accessories, the coffee or spice grinder (have one just for mixing dubbing) and the blender. For the grinder, keep the materials to 1/2 inch or less in length. This helps to prevent materials from winding around the blade or shaft. Pulse the grinder, do not run continuously. You may have to occasionally stop and separate if too much clumping happens. If you have a blender you can use it but add water first and pulse it. Strain the material and dry using paper towels and fluff when dry. The last method is my favorite, compressed air. Use your bobbin to poke about a half dozen holes through both sides of a zip lock bag. Add the material to the bag, put the long nozzle on a can of compressed air, stick the nozzle in the bag and zip it up. Now spray away, use some pulsing at first. Or, if you are like me and don’t keep canned air around the house, just wander into the garage and haul out the compressor. To view my various uses of custom dubbings, visit the online store. The Czech Catnip is one of creator George Daniel’s favorite anchor patterns. Daniel is a two time US national champion and former member and coach of the US Fly Fishing Team. The Catnip uses a heavy tungsten bead and lead wire in the underbody for weight to get the fly down deep where it belongs. 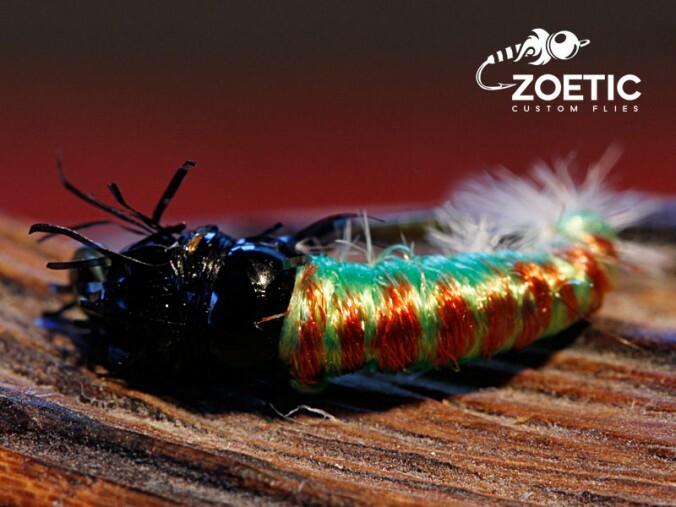 The body is made of micro polar chenille because of its buggy look and ease of use in tying. It is tied on a competition style hook, which is barbless and has a long thin point which gives it excellent penetrating power. It is most commonly tied in chartreuse or olive. Like other Czech nymphs, the Catnip is best fished down on the bottom using one of the tight line techniques. Daniel’s book “Dynamic Nymphing” is an excellent resource for these techniques. This fly can be purchased in our online store. An anchor fly is generally a larger, heavily weighted pattern that is used to get deep quickly and remain in contact with the bottom. They are used in Czech Nymphing and other similar tight line techniques. Originated because many competitions do not allow weight to be added to the line, these flies were created to also act as a sinker. High sink rates are archived by utilizing tungsten beads, lead wire and in some cases slim profiles ( ex. Lance Egan’s Iron Lotus). Anchor flies are the heaviest in multi-fly rigs, but that does not mean that they all have to be large, use tungsten beads and be loaded with lead wire to do the job. They simply have to be heavy enough to get to the bottom and remain there. While a large heavy fly such as a size 6 GDs Czech Catnip (George Daniel) might be required in faster moving waters such as can be found out west or in the early season creeks of Pennsylvania, in the Driftless Area of Wisconsin a size 14 Bead Head Prince Nymph may be enough to do the job. There are some excellent books available as well as free on line videos that detail the various nymphing techniques. Here is a link to part 1 of a three part series by George Daniel on nymphing techniques which includes contact nymphing. Anchor flies can be purchased in our online store.